The spawners have way too much health right now for their destructible nature to make any practical difference in game terms, I feel. Death Touch! They go down quite fast then. There seem to be two main mentalities players have when approaching the enemies: the "I need to clear out this entire room" approach and the "I'm going to save mana and dodge my way across the room" approach. I'd say most of us do a mix of both, with some people favoring one and some people favoring the other. Some people are just not going to be entirely satisfied until the room has been cleared. People want to be able to "complete" a room before moving on to the next one. There's a sense of accomplishment in that, and some gamers really thrive on it. It's also good for players who like a somewhat slower, more exploration-focused style of play, and thus want to clear out spawners as they go so that they don't feel rushed by the constant onslaught of enemies. Now that enemy spawners can be destroyed, these players are going to feel compelled to take the time to clear them out as they go through a room. This is a boring and tedious activity, and many players will get frustrated and grudgingly change their playstyle. It's probably not going to ruin the experience for many people, but they would probably have more fun if they were able to play the way they wanted. So why not let them? Would anything really be lost from the game if spawners worked on a "spawn once on each room entry" basis? Players who want the satisfaction of clearing a room before moving on would be able to do so and enjoy it. Players who don't care about clearing a room, and prefer to strategically dodge past the enemies to save resources would have the same experience they have now - since they're not killing the enemies anyway, it wouldn't matter whether or not the enemies came back after death. Let's look at an example of a very simple and common situation. Player A - Hop over the approaching enemy and grab the item. Wait a moment, then hop over the enemy again and exit the room. Practical and efficient. Nothing wrong with that. Player B - Attack and kill the enemy, then grab the item. Out of a desire to feel that the room has been "cleared", run over to the enemy spawner and spend several seconds blasting it until it is destroyed. A somewhat more practical player might instead kill the enemy, grab the item, and quickly leave the room before another spawns. Either way, this is not ideal for this player. Now let's imagine that the enemy spawner isn't there, just the lone enemy. How does each player approach the room now. 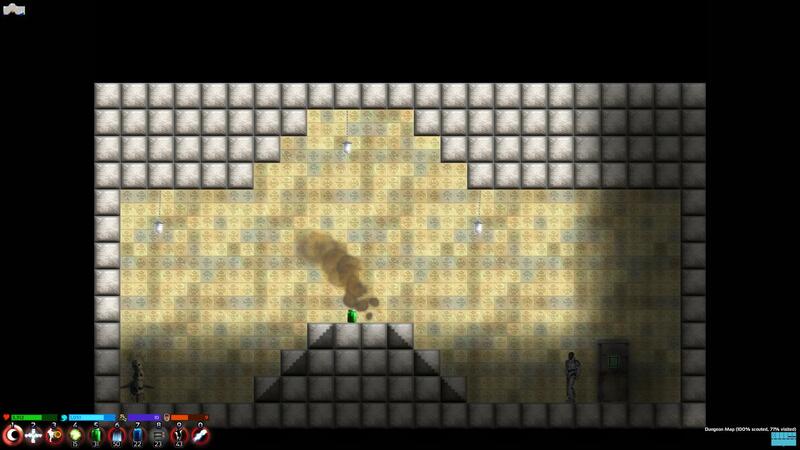 Player A - Hop over the approaching enemy and grab the item. Wait a moment, then hop over the enemy again and exit the room. This experience is unchanged and still enjoyable. Player B - Attack and kill the enemy, then grab the item. Take another look around the room to make sure that nothing has been missed, then leave through the door. Now we have a sense of accomplishment and satisfaction for this player. To be clear, I do not think that the room should remain clear into the future. Should either player decide to return to this room later, they would find that the enemy has returned, and they can then choose how to deal with it again. And I suspect that many players will actually tend to dodge the enemy on later visits. This is how I play games like Zelda and Metroid - the first time I enter a room, I take the time to fully explore the area, smash every crate, and kill every enemy. When I pass through the room again later on, I'm happy to ignore many of the enemies, as I have already mentally mapped the room; it has been "cleared" in my mind, even though there is now a fresh supply of enemies in it. But without being able to clear it out on that first visit, I would not have as enjoyable of an experience. And again, none of this applies to boss rooms, which can justifiably feature an endless stream of lesser enemies to contribute to the fight. So, my proposal again: Make enemy spawners invincible and invisible, but have them only spawn one enemy when the player enters the room. The spawner is then deactivated until the next time the player enters the room, at which point the room is repopulated with a fresh batch of enemies. If that seems like too dramatic of a change, here's an alternative: Leave everything the way it is now, but let enemy spawners be destroyed by a single melee attack (but they still regenerate when the area is reloaded). I'm having a hard time thinking of a downside to this! There are certainly other playstyles - for example I often jump or melee enemies, but some I like to fireball to knock them out of the way - nonlethal, and costs MP, but less so than killing would. If monsters are giving me a particular trouble (more common with skelebot dwarves and/or boss rooms) I take out the spawners. If the spawners were too much weaker I'd be killing them all the time. I don't have it yet, nor have I been given the option to learn it, let alone craft it. Which means that the ability to practically clear out monster spawners is presently tied to the number of spellcrafting books one finds (and a random element? ), plus the materials for the spell itself. I'm not necessarily averse to that idea - that clearing spawners is only a viable tactic one you've worked for it - but I wasn't sure that's what you were going for? Ok i admit i didn't read anything beyond x4000's first reply. The reason is simple, theres an so easy superior absolute awesome way to FIX this that i figured someone else must have mentioned it already. Judging from the discussion over 3 pages, i'd say this is not so. Actual step 3 - Make level transitions in a region cost time (5 to 10 minutes each) | Traveling on the overmap costs time as well (3 hours per tile) or something. 1. I am planning on removing monster spawners indoors and just having monsters. 2. Telling time and re-spawning after a certain amount of time has passed since you left the room is easy. I'm not sure there's a lot of value to it, though, because the idea of clearing out rooms permanently has some appeal to many folks (myself included, if I think about it), and we're already trying to minimize backtracking in the first place. Wait, will monster spawners outdoors never respawn now? No matter how long it has been or how far away you have traveled? At the moment: yes, that is correct, they never respawn. If that turns out to be a problem, we can later use our "rapid aging" methods to make it respawn them only if the chunk has been dormant for a certain amount of time. Thus far I'm not certain that will be needed, despite my prior fears. Even with my newly-acquired death touch, I still think they have too much health! Sure, they go down easy but it eats an entire magic bar in the process! Hmm, that is a good point. Many players (myself included) will do a depth first search style exploration. Meaning once they pass a monster spawner outdoors, they will almost never need to pass it again. Thus, in the outdoors, even if an area has been "wiped out", most players will very rarely return to that area. And thus it becomes an almost non issue. Now indoors, where the layout is much more complex, making backtracking often needed. This is a more interesting issue. Well... I'm open to feedback on this, but I don't really want them to be something that gets destroyed just because you pass it, if you know what I mean. I think their HP is a bit high. Since they've become destroyable, I have yet to actually bother to destroy one. I don't have death touch, so I'm only plinking away with fire touch, but it looks like it would take one to two minutes of just mindlessly holding down the attack button before I could kill one of these. I agree that they shouldn't just die in two hits either, but there should be some happy medium in there somewhere. On the other hand, I'm in the camp that's more interested in concepts for making monsters rewarding to kill rather than ways to get rid of spawners, so I don't have as much skin in this game. I heartily agree with this sentiment. I don't really get anything from destroying (or not) the spawners and can't see spending too much time thinking about them. I think making the regular monsters more rewarding to kill just makes sense. What that reward might be could be the subject of quite a debate, I would imagine. Just throwing in my support for the first point. I'm one of those players who would rather destroy all the enemies in a room and then explore it at my leisure. Spawn points are sort of my personal bane. But I do like the idea of allowing them outdoors, because outdoors already somewhat enforce running through and trying to get where you need to go (usually an indoor location) as quickly as possible. I'd also like to see outdoor spawners permanently gone if the player decides to destroy them. To that end, their current large max health is a good thing because they shouldn't be trivial to destroy permanently. But allowing them to be permanently destroyed allows me to create "safe" regions if I choose that can act as sort of homes away from home. I'll tone down their max health a bit. 75% sound good? That's already been there since yesterday!